Hair loss is a disturbing concern for all sufferers. However, it is clear that baldness has a tendency to be less common with women than men. Yet there is a condition, alopecia areata, which, unfortunately, can take hold of men, women and children alike. 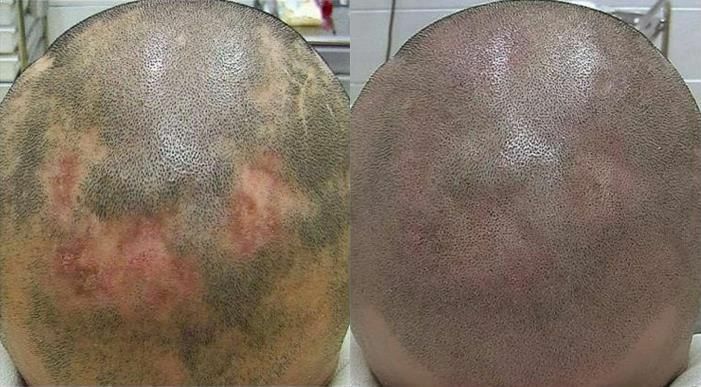 Alopecia areata is an autoimmune disease, whereby your immune system which is designed for protecting your body from bacteria and viruses, erroneously attacks your hair follicles instead. This attack will cause your hair follicles to diminish in size and slow down the hair production itself. The result, sadly, is the loss of hair on either the scalp, the body, or both. These can be small circular patches, often not extending any further. However, it can also attack to the extent that it is all over, from head to toe. On the plus side, the stem cells will carry on supplying the actual follicles with new cells. This gives the follicle the constant potential for regrowing new hair – but it may not be a quick process. Regrettably, albeit that researchers and scientists are beginning to understand alopecia, there is no cure. It's widely believed that genetics play a key role in the condition and additionally, it's certainly possible that a sudden virus or change in environment can bring on attacks. How does Scalp Micropigmentation help? Scalp micropigmentation, or SMP, is a process of concealment. It is, in effect, similar to tattooing whereby tiny small dots are applied to the scalp using a digitally controlled needle that uses hypoallergenic pigments. These pigments are administered at epidermal level, making scalp micropigmentation unlike the process of regular tattooing. Courtesy of the combination of natural pigments and how they are applied, the colour is not susceptible to change over the course of time and will instantly recreate the appearance of a full head of hair. Exacting requirements depend on each and every clients needs. However, there are, ultimately, two options for a patient to consider. These are to treat the patches that alopecia has created to camouflage the discrepancies, or to treat the scalp in its entirety. Call our team today on 0845 625 0025 and book yourself in for a consultation, a member of our Skalptec team will be able to give you more information on the prodecure and answer any questions that you may have.